Our GSD is the gentlest animal I've ever seen. He knows he can play a bit rough with me or other adults, never bites. But with the kids won't even open his mouth. If they try to feed him he'll lick the food out of their hand until it drops and then pick it up. He was afraid of strangers, noises, or even a piece of paper blowing in the wind. About the time he turned one that all changed. He is still a kind, gentle dog. However, if he perceives you as threat to me or the family, you're in deep doo-doo. There is an instant switch big furry pooch to Cujo. The first time I saw him go into Cujo mode it startled me. But, is nice to know he'll be there if things go bad. 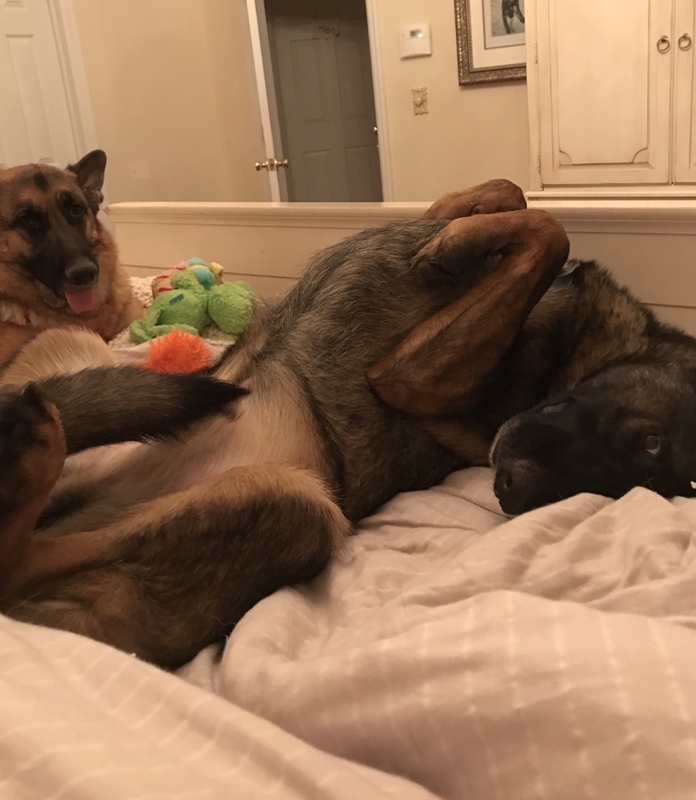 Is this typical GSD behavior? Mine (part husky) also discerns what is "OK" and what isn't. I think "OK" means: me opening the door to them, and saying Hi in a friendly voice. What's "NOT OK" is, for instance, the HVAC guy coming back in to check the thermostat within knocking first. Or the plumber, who went back to his truck to get some tools and let himself back in. Or the tree cutting guy who had a ladder up on the side of my neighbor's house. In those cases, my dog will follow them around, watching them constantly, and letting out deep barks and growls. (I can get him to calm down, but I have gotten some nervous looks and comments from people). So I guess I do feel somewhat safer? At least, I won't be taken by surprise! I have had the flu all week and really hit me crazy hard especially today. Topper, Luna and Max all keeping me company making me feel safer! Photo of max and Luna the other day making me smile through the haze lol! Last edited by Jenny720; 01-15-2019 at 01:39 PM. She is only about 12 weeks old but she has her big girl bark for sure! I feel safe taking her and her sister out for walks even though it’s dark outside. She can spot a javelina in the dark before I can that’s for sure! I still carry self defense items when we’re on our walks just in case certain desert creatures get any funny ideas. Sabis mom and mkculs like this. Having a dog greatly reduces your risk of being victimized by opportunity criminals. It does not have to be a big dog--it's the noise they make, first, and the additional risk of the perpetrator being bitten, 2nd. That being said, I love having my big dogs with big barks around me and my family. You'd have to be an idiot to take on my dogs to try to get to one of us. My running dogs have also intercepted and/or deterred other dogs that might have posed something of a risk to me while running (mostly dogs are just curious, but you never know). No one has ever gotten hurt. On the other hand, I'm quite sure my dogs are at risk if there ever is a confrontation, b/c too many people carry guns and would not hesitate to use them on a dog, b/c they don't hesitate to use them on people. Maybe it would give me a better chance, but I don't want to risk my dog's life unless there is no other choice. I am pretty skilled at de-escalation so while this is still true, I have never had a public confrontation that left me fearing for my safety--never had one, period. I'm not into insisting that I'm right when clearly the other person doesn't have the mental capacity to appreciate it. Best to side-step and move on. Nothing to prove here. Although this isn't one of the reasons I ultimately wanted a GSD, I have to admit he does make me feel safer. I'm liking that aspect of the breed a whole lot. I picked them for their loyalty, brains, beauty, and movement. This is just a great bonus!